The 19th Century Studies Network Symposium being held at UNE today looks back to period that in some ways is closer to our times than the just-departed 20th Century. “A new Industrial Revolution of automation is disenfranchising the working class, the poor are rebelling against political structures that benefit a few, Russia is back re-fighting the Crimean War, Britain is pursuing splendid isolation,” said Richard Scully, Senior Lecturer in Modern European History and convenor of the symposium. That century of small wars waged by big empires, advancing industrialisation, and the industrious artists who documented and interpreted the century’s changes, will be discussed at the symposium, which brings together members of the 19th Century Studies Network. 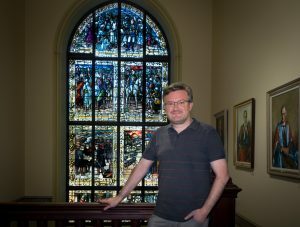 Dr Richard Scully before Booloominbah’s stained-glass window celebrating the Victorian-era empire-building exploits of General Charles Gordon. Until now, the network has existed largely as a virtual, online group, but a conversation earlier this year led to the symposium to bring members together physically in Armidale. The symposium, which is open to the public, will give researchers a chance to hear about each other’s work, and share ideas on how to further their studies. UNE has had a long history of excellence in 19th Century scholarship. Dr Scully said a committed group of researchers is working to keep that reputation alive and to build upon it in innovative ways. The School of Humanities continues to publish its annual scholarly journal – the Journal of Australian Colonial History – edited by Associate Professor of Australian History (and network member), Dr David Roberts. The university is itself literally built around the 19th Century, in the form of the 1880s mansion Booloominbah, now UNE’s administration centre. The mansion’s great stained-glass window commemorates the martyrdom of General Charles Gordon at Khartoum in 1885 in one of the many wars fought in the name of empire. The symposium is being held from 9.30am-5pm in Lecture Theatre A3 in the Arts Building (E11) at UNE. The keynote address was delivered by Sydney University’s Dean of Arts, Professor Barbara Caine. The 19th Century Studies Network welcomes anyone who wishes to sit in on the presentations.